Character. Cost: 4. STR: 3. Challenges Action: Return Painted Dogs to your hand to choose and stand a Clansman character or Tyrion Lannister. 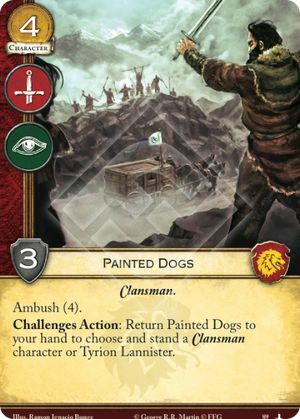 If Painted Dogs is the only kneeling Clansman character present (and Tyrion is not in play), you can still trigger and return it to hand (because there is an eligible target present when the check is made).